With exciting curriculum designed to offer the best instruction, workout, and practical defense available, you won’t find a more comprehensive self-defense program in the area. THE EDGE will challenge your mind and body as you learn effective take downs and real self-defense techniques. You’ll begin to feel more confident, reduce stress, and set goals in your personal life as well as in the workplace or school. Achieve Your Goals. Change Your Life. Are you ready to make a change in your life that can make a difference? Do you want to feel confident that you can defend yourself? Do you want to be motivated to achieve the goals you have set in life? 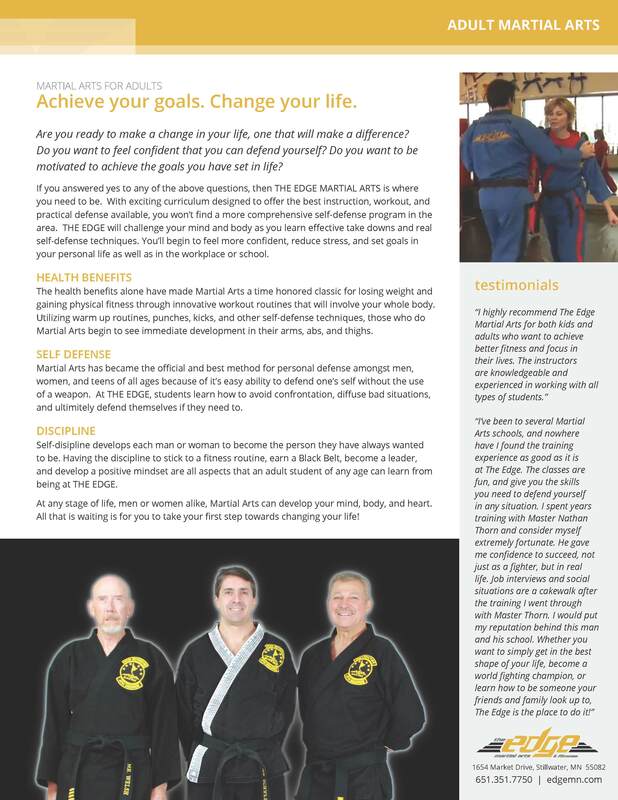 If you answered yes to any of the above questions, then THE EDGE MARTIAL ARTS is where you need to be. The health benefits alone have made Martial Arts a time honored classic for losing weight and gaining physical fitness through the innovative workout routines that involve the total body. Utilizing warm up routines, punches, kicks, and other self-defense techniques, those who do Martial Arts begin to see immediate development in their arms, abs, and thighs. Martial Arts has became the official and best method for personal defense amongst men, women, and teens of all ages because of it’s easy ability to defend one’s self without the use of a weapon. At THE EDGE, students learn how to avoid confrontation, diffuse bad situations, and ultimately defend themselves if they need to. Self-discipline develops each man or woman to become the person they have always wanted to be. Having the discipline to stick to a fitness routine, earn a Black Belt, become a leader, and develop a positive mindset are all aspects that an adult student of any age can learn from being at THE EDGE. At any stage of life, whether man or woman, Martial Arts can develop your mind, body, and heart. All that is waiting is for you to take your first step towards changing your life! Share This Page Know someone who could benefit from what you've seen?